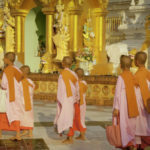 Rangoon, Burma’s bustling metropolis is like a living museum where traditional teahouses, pagodas and temples sit side by side with grand edifices like the Strand Hotel built during the days of British colonialism. Among these treasures is the 2,500 year old Shwedagon Pagoda considered the most magnificent Buddhist shrine in all of Asia. During the Colonial Era, when Rudyard Kipling sailed up the Yangon River, he wrote of his sighting of the pagoda’s golden dome upon the horizon as his vessel neared the city. That glistening stupa still dominates today, both architecturally and symbolically. Story and Photos by Lee Daley. In 2003, I traveled to Myanmar, formerly called Burma. We flew to the capital, Yangon, once called Rangoon, before journeying on to Mandalay where my traveling companion and I boarded the river boat, The Road to Mandalay.Thus began some of our most memorable days in the country. We talked with locals who often told us of their love for dissident Aung San Sui Kyi, whom they called “The Lady,” and of their desire to see Myanmar’s name restored back to Burma. Story and Photos by Lee Daley. 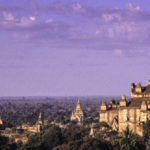 Burma is now on many world travelers’ “A” list. With the release of Nobel Prize Laureate Aung San Suu Kyi from house arrest and her subsequent triumphant election campaign, tourism to the country is at an all-time high. Decades of international isolation have left the former British colony’s major city, Rangoon, with an enduring colonial charm that has pretty much disappeared elsewhere in Asia.